With the advent of new coins in the form of icos, I am here to present to you another moving cryptocurrency to meet the urgent need of prospective cryptonaires in terms of investment and the rest of the world in terms of services and utilities. 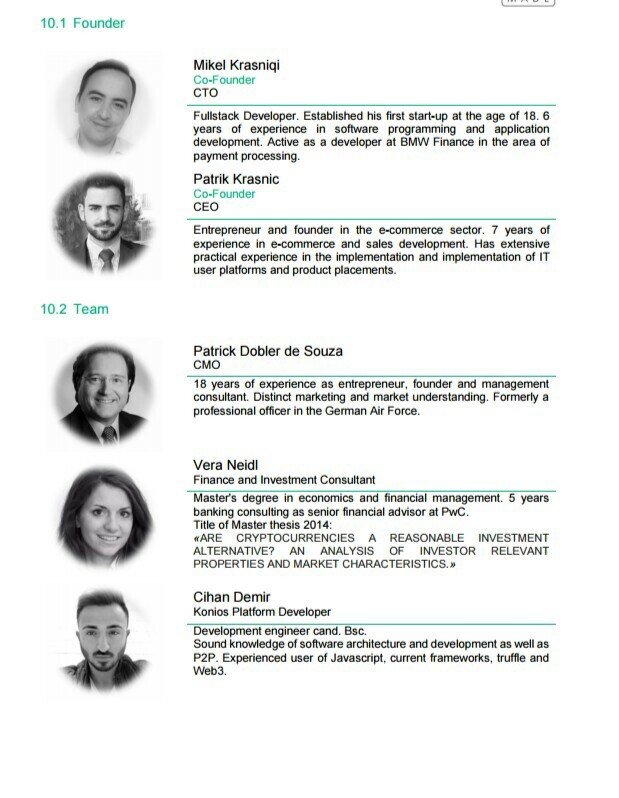 KONIOS has been a project with a healthy team and a big vision that is encoded in its services and utilities. Konios was created by a duo composed by Patrik Krasnic (CEO) and Mikel Krasniqi (CTO). The duo mixes the ability of e-commerce by Krasnic and the development abilities of Krasniqi. With a team of about 10 other professionals and four advisors. As stated before, the goal of Konios is to create easy solutions for people who want to invest in cryptocurrencies. Its platform will offer an easy way to buy and sell crypto and cash out whenever you want. The company believes that the restrictions and regulations are bad for the blockchain market because they will hold the industry back from growing, so the solution is deregulation. The company is also offering a place for posting services on the platform and be paid with cryptocurrency or fiat currency, which will make it more than an exchange. You can also offer products if you want. You just have to photograph them and then you will be able to sell them anytime that you want to. Konios will be an Ethereum based platform. This means that it will be powered by the Ethereum blockchain and use smart contracts for the transactions. At the moment, you can not use Konios because the platform is still not operational, but it will be during 2018 (on Alpha and Beta phase). The tokens of the company, KON tokens, will be necessary for you to access the services. You can get them on the sale or in airdrops. Konios might have a discourse which speaks of revolution, but it is a quite a normal company, actually. It can work as an exchange, a financial platform and even a marketplace, so be aware of that before you invest in Konios. we offer you a token of appreciation for your support. Supporter and Guides are indispensible, and should be rewarded for their support! Thank you for believing in our Project.